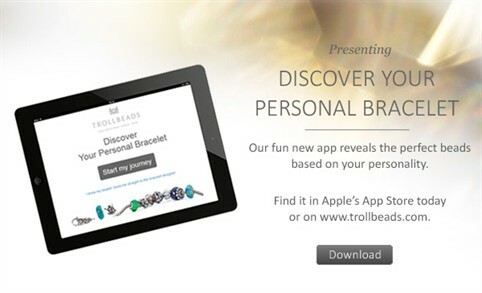 Today Trollbeads have launched a brand new “Discover Your Personal Bracelet” app. This app is an innovative step by Trollbeads and is much more than the regular bracelet designer tools already available. The app proposes an individual and personalized bracelet based on your answers to a number of quirky questions. For each question answered, a bead is selected that reflects your answer, creating a truly unique and personalised bracelet. A great way to put together a gift for someone special and just as much fun to have a go for yourself! For those of you already familiar with the full range of Trollbeads, the app includes an element where you can hand pick beads and put them on a bracelet to visualise how they work together. This is more in line with the original bead on bracelet type of app, but adds extra functionality for those prefer to choose beads themselves. The app is available via www.trollbeads.com and is also available via Apple’s App Store. Here is the link to the app via Trollbeads UK .. I have had a go with it and think it is really cool, a perfect idea to help choose Christmas gifts! To coincide with launching the app, Trollbeads have produced a short film to promote the app. This funny and quirky video shows exactly how the app works … and when it could come in useful!!! I would love to see this advert on TV. In my opinion it demonstrates how Trollbeads, creator of the original “bead on bracelet” concept, will always be at the forefront of their market.